Anybody know how to delete assets that have been deleted and stop this warning from popping up all the time ? I also have the latest beta release by the way. I have done that Norm and removed, but on saving the project after doing said task and then opening it up again it continues to ask ? I also have double images in my blocs asset folder,but not in my saved project image folder ? still a ongoing problem and i am tried the latest beta release also ? That’s because Blocs doesn’t embed the images in your project. It links to them on your other computer. Unless you use iCloud in which case the latest Blocs beta fixes that. Are linking to relative paths from project file, or full path names? File a bug report, that’s the best way to get it addressed, I miss a lot on the forum hence the notes dotted about for reporting in app. I’ll most likely need your file and some background info on when it all started. Start Blocs, click support link from the start window, mention this convo and I can take it from there. @ScottinPollock the only images that are linked to with relative paths are the built in images. Because of the way Blocs works, it uses full paths, this new issue is caused by a number of fixes I initially put in place to escape special characters that prevented images working with odd characters in the file name or path. @Norm Are there plans to make the assets library paths relative? Having absolute paths severely limits .bloc project backup and sharing abilities. I am really confused by this design choice since it locks a bloc project to one computer’s filesystem. Unfortunately because of the way Blocs is designed it’s not possible, as it uses its own file type it’s not a traditional web design tool. But this is no different to lots of other design apps such as After Effects and inDesign etc. The reason Blocs can’t use relative paths is because it’s not loading standard HTML pages, it’s generating the pages on the fly while you work. To get this to work would mean embedding assets in the files, this would mean the .bloc files would be huge, the assets added wouldn’t be able to be updated outside of Blocs anymore and it would essentially be creating duplicates of data on your HD, taking up more space. We considered the limitation you mentioned in version 1 of Blocs, so it is possible to share projects between machines. Blocs has a built in feature that will auto connect up assets as long as they are all placed in a folder named images, the Blocs project should be positioned at the same level as this images folder (not inside it). I’ve been meaning to create an export option for this, so you can automatically generate a copy of the file with accompanied assets ready to share. BTW You can also host assets on Dropbox etc and Blocs will handle restoring this connection when opening on diff machines. Please do so, as soon as you can. I’m getting pissed too. I’ve been back and forth with the FTP client - Yummy and blaming them about the software removing assets, and it’s not them. It’s Blocs. This has to be fixed. It’s wasting my time having to Mirror the Server and the Folder every time I try to upload. Blocs has a built in feature that will auto connect up assets as long as they are all placed in a folder named images, the Blocs project should be positioned at the same level as this images folder (not inside it). Thanks @Norm This is good news. I will give it a try. I look forward to some solution in the future that makes migration a little easier. @Norm I tried to do the method of moving all image assets to a folder called “images” located at the same directory as the .blocs file. The image file assets were copied from the resulting website structure from the “File>Project Export” menu. 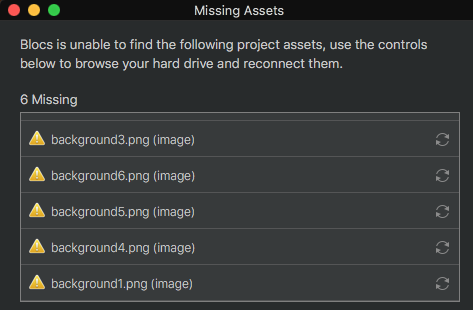 I moved the blocs file and the image resources to another computer, and the asset library complained about missing images. I can manually link images, of course, but there didn’t seem to be any way to initiate the auto-connection that you were talking about.